The tension was building throughout the week, but finally just before Valentine’s Day weekend the negotiators in Geneva completed the first draft of a Paris negotiating text and released it at the end of the eighth part of the second session of the Ad Hoc Working Group on the Durban Platform for Enhanced Action (ADP). Contained within this 86 page document, replete with perhaps 400 or so carefully worded options to select from and 1,234 square brackets, is supposedly the necessary political recipe for addressing the climate issue over the coming decades. Or were we presented with the greyness of diplomacy and compromise, which may be the best that can be managed for now, but doesn’t incorporate the necessary toolkit to drive down emissions in the decades to come? The text certainly contains sufficient versions of one important overarching requirement; that being the need to reach net zero emissions at some point in the future. In the context of the level of greenhouse gas emissions, the word zero appears in the text seven times, from a non-specific reference of “net zero greenhouse gas emissions in line with the ultimate objective of the Convention“, to the highly ambitious proposal for “zero emissions of CO2 and other long-lived greenhouse gases in the period 2060–2080“. I discussed this at some length in my previous post, with the conclusion that an end of the century net zero emissions objective is perhaps achievable, but much earlier than this looks unlikely. Even a timeframe of 85 years will require enormous effort, including extensive use of carbon pricing and the widespread deployment of carbon capture and storage (CCS). This view received quite a number of comments on The Energy Collective. My post wasn’t to argue that nothing would happen or that no progress could be made, but to point out the difficulty of rapidly slowing down and turning a system that has such enormous momentum. All of the suggested technologies that filled the comments section will almost certainly play a role, but the challenge is the time it takes to do all this. My own experience in the energy industry tells me the timeframe is decades, not years. In my view, the text now taking us forward to Paris doesn’t present the necessary conditions for a strong response, but it is only part of the story and much more will be revealed over the coming weeks and months as the INDCs (Intended Nationally Determined Contributions) are also published. This text seems to be more about achieving some diplomatic harmony around the climate issue and at least trying to get everyone marching to the same tune. Any agreement reached at the UNFCCC COP 21 in Paris at the end of 2015 should promote the use of carbon markets and facilitate the future linking of emissions trading systems. One final reality check on the paris text is that nowhere in the 86 pages is CCS mentioned. While the UNFCCC is always very careful about featuring a specific technology and understandably so, the clear advice from the IPCC 5th Assessment Report was that 2°C cannot be reached without it, at least not within reasonable cost bounds. The IPCC does get mentioned 23 times. In contrast with the events in Geneva, BP published their Energy Outlook 2035 which showed both overall energy demand and demand for fossil fuels rising in the outlook period (see chart; source: BP). 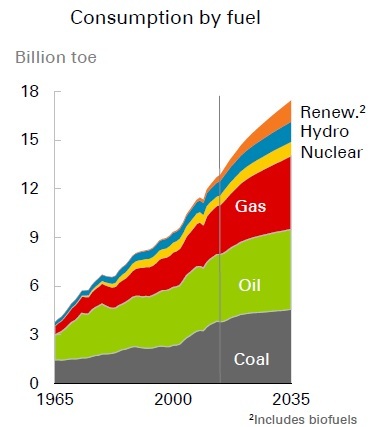 The corresponding rise in energy system emissions is also given, reaching some 40 billion tonnes per annum by 2035. 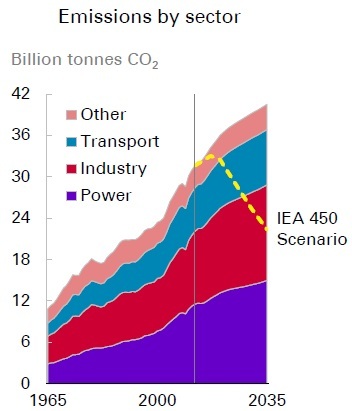 This is in contrast to the IEA 450 Scenario which argues for a fall in emissions to nearly 20 billion tonnes by 2035. 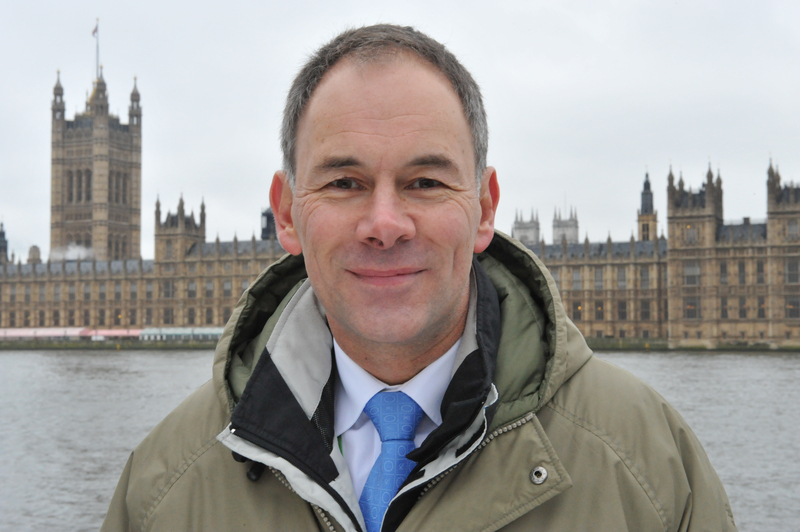 However, the outlook does include a rising carbon price through to 2035, when it reaches some $40 per tonne CO2. Judging from the data presented, the main impact of this seems to be to bring coal growth to a near halt, but that’s all. 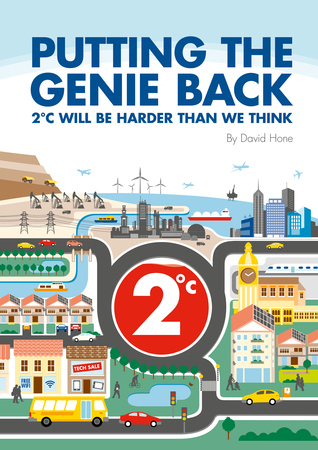 The BP analysis presents a very different outlook to the one we need to stay within the 2°C threshold agreed by governments at the Cancun COP back in 2010. It also argues for a clear and robust outcome from Paris, although the current text doesn’t point in that direction.